Ross Barkley and Romelu Lukaku each scored twice as Everton thrashed a dreadful Aston Villa, who remain stuck at the bottom of the Premier League. Barkley had two simple tap-ins, the first after Brad Guzan saved from Gerard Deulofeu, the second following some awful Villa defending. In between, Lukaku headed his 50th Premier League goal, then finished a wonderful move soon after half-time. Villa are without a win in 12 games since the opening day of the season. A tally of five points after 13 matches is their worst return in any of their previous top-flight campaigns and they remain five from safety. Everton, meanwhile, have scored 10 goals in recording back-to-back home wins for the first time since April and climb to seventh. If a creditable goalless draw with Manchester City in Remi Garde's first match in charge gave Villa some optimism about beating the drop, then this was the starkest of reality checks. Garde looked to build on the solidity of that draw, his intention clear in the early stages with Villa happy to to concede possession and keep men behind the ball. However, the visiting defence was not up to the task of dealing with Lukaku, Barkley and the excellent Deulofeu. Not only that, but Villa also created problems for themselves. For Everton's third goal, no fewer than four defenders and the on-rushing Guzan failed to deal with the ball bouncing in the area, with Barkley eventually rolling into an empty net. On top of all this, Villa showed virtually no attacking threat, with not one of their players posting an average position in Everton territory during the first half. By this evidence, Garde faces an almighty task if he is to keep Villa from relegation. Pinning this result solely on the inadequacies of Villa would be unfair on Everton, who put in a ruthless, clinical and entertaining display of attacking football. Deulofeu tormented Kieran Richardson down the Everton right, from where the majority of the home team's attacking threat came. His shot, after good work from Lukaku and James McCarthy, led to Barkley's opener, with Seamus Coleman again supplying from the right for Lukaku's header to make it 2-0. Barkley nipped in to take advantage of the defensive chaos for the third, but it was Everton's fourth that was most impressive and came as their three stars linked up. Deulofeu surged through the middle, fed Barkley, whose one-touch pass was perfectly placed into the path of Lukaku, who lifted over Guzan. Lukaku's first goal was his 50th in the Premier League, the 22-year-old becoming only the fifth man - alongside Robbie Fowler (92), Michael Owen (91), Wayne Rooney (71) and Cristiano Ronaldo (54) - to reach that landmark before his 23rd birthday. This was the 201st league meeting between Everton and Villa, and it is the most played fixture in English league football. If Villa fail to improve, then the 202nd in March could be the last for some time. Everton manager Roberto Martinez: "It was a really strong performance. You're are always worried how you will react after an international break, but it was very pleasing. It was a complete performance. "You get used to hearing Lukaku's name, but it's a good reminder that he is such a young man. It is a very elite group that he has joined. It is great to see him growing all the time and this season he has gone to a different level. "Ross Barkley is coming into his mature best. To play the amount of football he has in the last seven days and still get to that level is remarkable." Aston Villa manager Remi Garde: "In the first 30 minutes we were not good enough to resist. We didn't want to concede an early goal and we did. After that it was too difficult. "When you concede four goals it is not a good performance. We will have to work on that. The second half was better. I was not pleased at all with the first half. "I knew the size of the task before I came. Today we lost 4-0, I prefer to lose one game 4-0 than four games 1-0. We have to be ready for the next game, because that is very important." Villa's long quest for a win next takes in the visit of Watford next Saturday. Everton make the long trip to Bournemouth on the same day. 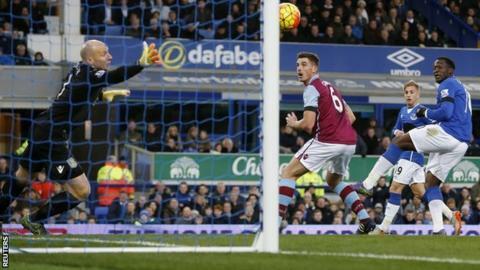 Match ends, Everton 4, Aston Villa 0. Second Half ends, Everton 4, Aston Villa 0. Attempt missed. Romelu Lukaku (Everton) right footed shot from outside the box misses to the right. Attempt blocked. Romelu Lukaku (Everton) left footed shot from the right side of the box is blocked. Assisted by Kevin Mirallas. Jordan Veretout (Aston Villa) wins a free kick in the defensive half. Attempt saved. Kevin Mirallas (Everton) right footed shot from outside the box is saved in the centre of the goal. Assisted by Darron Gibson. Kevin Mirallas (Everton) wins a free kick on the right wing. Attempt missed. Kevin Mirallas (Everton) right footed shot from the left side of the box is high and wide to the left. Assisted by Darron Gibson. Delay in match Romelu Lukaku (Everton) because of an injury. Attempt saved. Romelu Lukaku (Everton) right footed shot from the centre of the box is saved in the centre of the goal. Substitution, Everton. Darron Gibson replaces James McCarthy. Corner, Everton. Conceded by Brad Guzan. Attempt missed. Kevin Mirallas (Everton) right footed shot from outside the box is close, but misses to the left from a direct free kick. Attempt blocked. Brendan Galloway (Everton) left footed shot from the left side of the box is blocked. Assisted by Kevin Mirallas. Foul by Charles N'Zogbia (Aston Villa). Substitution, Aston Villa. Charles N'Zogbia replaces Jack Grealish. Substitution, Everton. Leon Osman replaces Ross Barkley. Attempt missed. Jordan Veretout (Aston Villa) right footed shot from outside the box is too high. Assisted by Rudy Gestede. Micah Richards (Aston Villa) wins a free kick in the defensive half. Attempt blocked. Ashley Westwood (Aston Villa) right footed shot from outside the box is blocked. Assisted by Jack Grealish. Attempt missed. James McCarthy (Everton) right footed shot from outside the box is high and wide to the right. Attempt saved. Jordan Ayew (Aston Villa) right footed shot from outside the box is saved in the centre of the goal. Assisted by Ashley Westwood. Attempt saved. Jordan Ayew (Aston Villa) right footed shot from the centre of the box is saved in the bottom left corner. Corner, Aston Villa. Conceded by John Stones. Attempt blocked. Jack Grealish (Aston Villa) right footed shot from outside the box is blocked. Assisted by Jordan Veretout. Offside, Aston Villa. Jordan Ayew tries a through ball, but Alan Hutton is caught offside. Attempt saved. Arouna Koné (Everton) right footed shot from outside the box is saved in the centre of the goal.